Since the year 2002 premiered ‘The Greatest Theft ever told’, Daniel Monzón had not returned to try the dynamics of comedy. Precisely, that film was the first collaboration between Monzón and the scriptwriter Jorge Guerricaechevarría, that man who writes everything in Spain and who in just one year has Songbird premiered ‘Perfect strangers’, ‘El cuaderno de Sara’, ‘El aviso’ and the title that concerns us: ‘Yucatán’. The premise, on paper, promised a ribbon of entanglement, swindlers and swindles and plans without fissures that end up making water, with the lure of kitsch baroque that is presupposed to a cruise as a location, epitome of tourism overexploitation free buffet, buffa fauna and final bingo with jackpot. In ‘A Night at the Opera’, the Marx Brothers have already experimented with the dramatic possibilities of the itinerant microcosm and the obligatory and fevered happiness that is a transatlantic, A Lesson in Cruelty with the freedom to weave a network of plots as wide as the number of staterooms. In addition to the multiculturalism offered by an intercontinental trip and the range of potentially caricatured characters taken from the passage and the crew. For Hawaiian shirts and extramarital affairs, which is not left: the laws of the sea exempt from the mesetary protocol. However, in a film with so many characters, it is essential to maintain a course, and ‘Yucatan’ does not manage to contain, on the one hand, a surplus of characters, some of whom it seems that the director has been forced to sacrifice – like the marriage formed by Toni Acosta and Xavi Lite-, and on the other, the circumlocutions Knuckleball in the development of the plot, which is heavy digestion. Monzón does not quite find the rhythm in the coming and going of the cabins and the script resorts to gags as scorched as the laxative in food, which anyone would suppose already overcome. 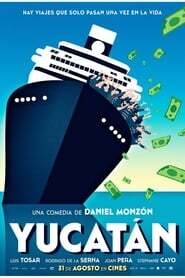 The cruise of ‘Yucatan’ gives so many rudder blows throughout the film that, even knowing where you want to go, it shows a sense of loss, of abuse of accessories to hide deficiencies. Of course, musical numbers-there are many, and many-have their grace.